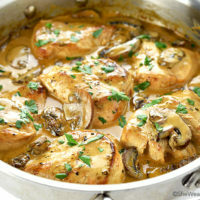 This one skillet Chicken Breasts with Mushroom Cream Sauce Recipe is a delicious way to turn plain chicken breasts into something special in about 30 minutes. Are you chickened out? You know what I mean, chicken this and chicken that. Boring and ho hum chicken again for dinner. 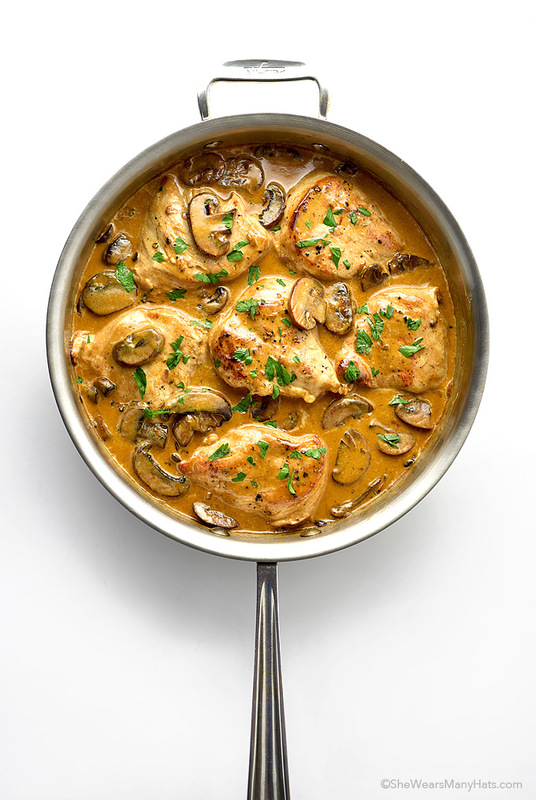 Well say goodbye to that boring, ho hum chicken and say hello to Chicken Breasts with Mushroom Cream Sauce. I sound like a car dealer. This chicken is better than any car. You can’t eat a car. Or at least you shouldn’t. That would be weird. But this chicken, this chicken isn’t weird. It’s scrumptious! Let me tell you all about it. Inspiration began with Julia Child’s recipe for Chicken Breasts with Mushrooms and Cream from Mastering the Art of French Cooking. I followed Julia’s basic flavor profile, using most of the same ingredients and measurements, as well as the first steps for making the cream sauce. But I veered off from her recipe, using skinless boneless chicken breasts and ad libbing ingredients and measurements here and there, because, you know, it’s a free country. After a little simmering and saucing this delicious dish was ready. And, holy Toledo Batman, this Chicken Breasts with Mushroom Cream Sauce is some kind of goodness, far from boring or ho hum. 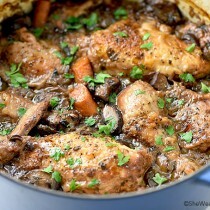 The savory cream sauce with a hint of cognac combined with the chicken and mushrooms is most satisfying. 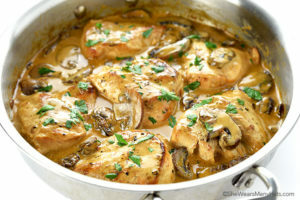 Chicken Breasts with Mushroom Cream Sauce is an excellent go to if you are entertaining or want to prepare a meal for a special occasion. While the cream and cognac are a bit indulgent, this recipe is not as fancy as it seems. It’s a super easy recipe and can be made in about 30 minutes. Plus, you can keep it warm on the stove (or transfer to a crockpot on very low heat) until you’re ready to serve. Since this recipe is so easy to prepare, it’s become a fabulous addition to our regular dinner rotation. I tend to keep most of the ingredients stocked up and ready to prepare on the fly for those nights when I haven’t planned very well. Sometimes I may have to swing by the grocery store to grab mushrooms or a shallot (or use garlic in a pinch), but I usually have everything on hand for this one. So what are you waiting for? Ditch that ho hum plan for boring chicken and take this Chicken Breasts with Mushroom Cream Sauce for a spin. Serve with a side of veggies, like roasted asparagus, or a simple tossed salad for a meal that will make you forget all about boring. Enjoy! 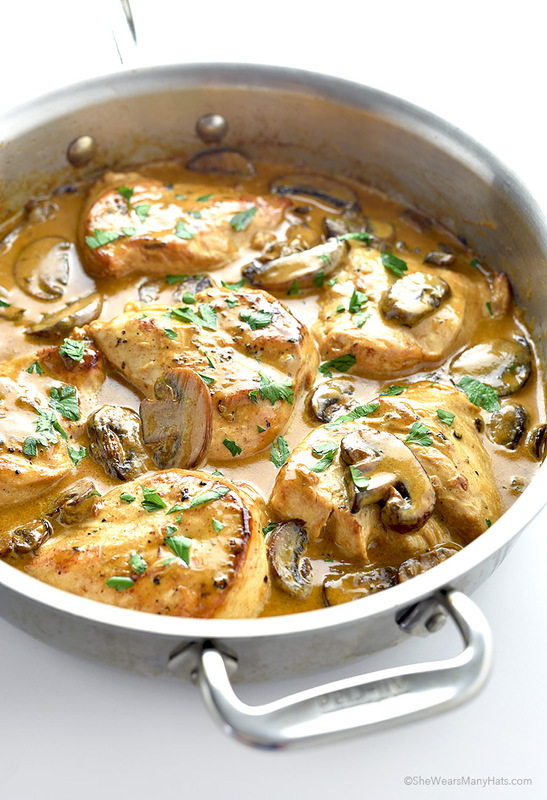 This one skillet Chicken Breasts with Mushroom Cream Sauce Recipe with chicken and mushrooms in a savory cognac cream sauce is a delicious way to turn plain chicken breasts into something special in about 30 minutes. Pound chicken breasts lightly to about 1/2-inch thickness. Heat a large skillet over medium heat. Add 3 tablespoons of butter; allow to melt. Add chicken breasts in a single layer. Sprinkle with lemon juice, salt and pepper. Brown on each side for 3 minutes. Transfer to a plate and cover. Add remaining 2 tablespoons of butter to pan; allow to melt. Add mushrooms and minced shallot, plus a pinch or two of salt. Cook, stirring occasionally, for 5 minutes. Stir in beef broth and cognac, scraping up any brown bits from the bottom of the pan. Bring to a steady simmer. Simmer, stirring occasionally for 2-3 minutes. Stir in cream, bring back to a steady simmer. Bring to a low simmer. Simmer, stirring occasionally, until thickened slightly, about 2 minutes. Reduce heat to low. Season to taste. Return chicken breasts to pan, turning to coat in sauce. Cook on low until chicken is done through. Thanks a lot for your exquisite recipes. 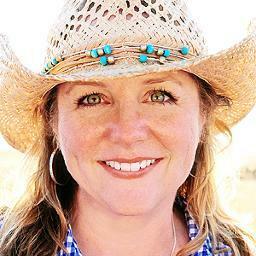 What a great personne you are. Thanks once again. What can I substitute for cognac? I used brandy instead of cognac and garlic instead of shallots and chicken broth instead of beef broth and it turned out ASTOUNDING!! And, for cooking the chicken until “done through”……approximately how long is that? About 5-7 minutes, but make sure chicken is done. Can you leave the cognac out or replace it with something? I would try substituting apple juice. 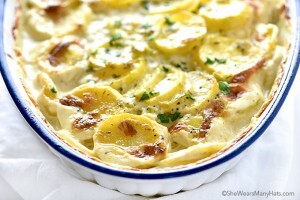 This is the perfect skillet dinner! Everyone I know LOVES chicken and mushrooms. I love the look of this dish, I will be making this and serving it with mashed potatoes to soak up all those wonderful juices. 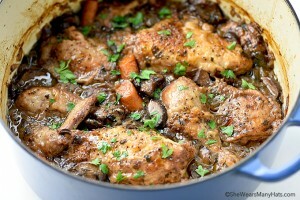 This is the perfect skillet chicken recipe and your mushroom cream sauce rocks! That sauce looks so amazing. I’m a sucker for creamy sauces! 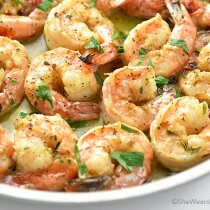 I love the cognac addition, so much flavor and this is such an easy recipe. My husband and I loved this! Thanks for the fabulous recipe! 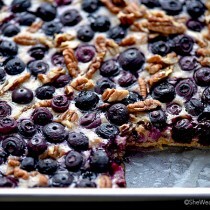 I absolutely love this recipe – we make it all the time! Thanks for sharing. Mmm, this looks so yummy! Five star dish. The chicken and sauce was the bomb! I followed the recipe as written with the exception of adding 2tsp of fresh minced garlic. Oh my goodness, that was amazing. That sauce! I want to just make the sauce and eat it with a spoon.